Jim McCormick promised his ADE-651 wand could identify anything, including bombs, simply by waving it around with the right RFID card inside. Yeah, totally fake, and now he's in prison. Too bad Iraq already spent $85 million on them. Updated. Literally, the $40,000 (apiece) devices did absolutely nothing. Nada. Zilch. Experts think the insides contained nothing more than a dumb RFID card. Powered by nothing. Nope, not even a power supply. Just some snake oil, if that. $85 million! Even worse, "inventor" McCormick was a firm, open believer in dowsing (as in, finding water with a stick), and that's what the device was based on. Dowsing! Now the money lost is bad, but the loss of life is worse. Immeasurable. Security personnel and Iraqi soldiers were using these powerless dowsing rod devices in the field to detect bombs at security checkpoints and who knows where else. Scores died with this murderous thing gripped tightly in their hands. 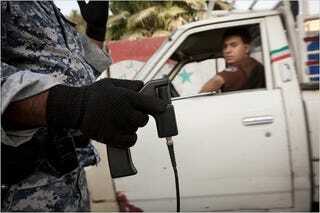 Hundreds more when the security checkpoints, armed with these devices, failed to protect them. Update: We ran the US's doubts on this device in November. This story confirms without a doubt that devices were fake, probably resulted in hundreds of deaths, and that McCormick, thankfully for the human race, has been arrested and is awaiting trial (although he's currently out on bail).